What Happened To The Leafs Top PP Unit? - The Point Data-driven hockey storytelling that gets right to the point. The Leafs top powerplay unit started the season scorching hot, spending most of the early season on top of our leaderboard of top powerplay units in goals scored per-20 minutes of ice-time. However, in the last six games, this units performance has fallen off a cliff. 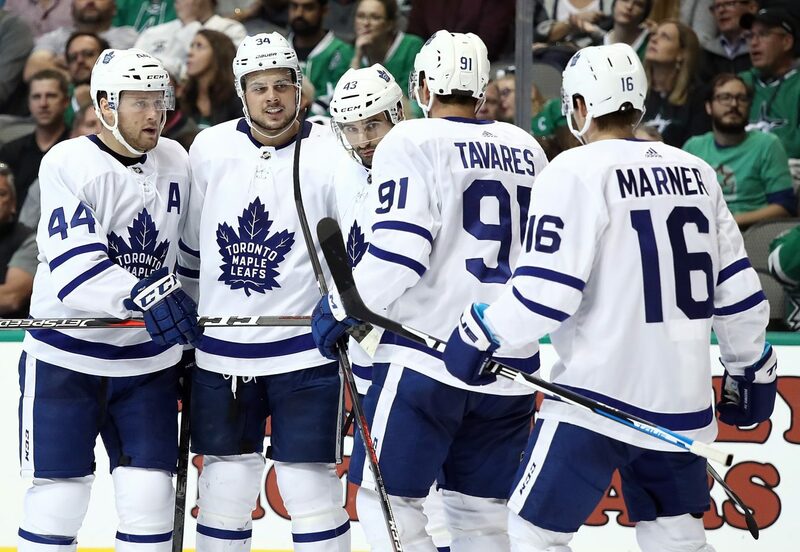 The group of John Tavares, Mitch Marner, Auston Matthews, Nazem Kadri, and Morgan Rielly has actually been held without a goal in its last six games and has fallen out of the top 5 most productive 5-man groups in the league. It’s not just a case of bad puck luck either, their performance is down across the board. 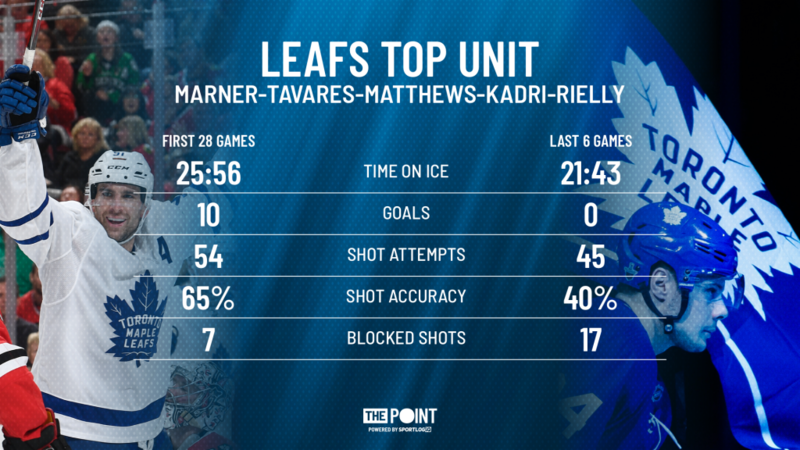 Keep in mind, we are talking about the specific 5-man unit mentioned above, which doesn’t include the Leafs ‘top unit’ while Matthews was out of the line-up, so ice-time is relatively even over the last six games compared to all games before. When looking at this units performance, the most jarring change is its sudden inability to hit the net. They went from hitting the net on roughly two-thirds of their shots to well under 50%. So, how did this happen? Well, over their last 6 games, the Leafs haven’t been able to generate as many shots from in-tight. Roughly 58% of their shot attempts have come from the slot area, a massive drop off from close to 80% prior to their drought. Shooting a lot more often from distance has led to a massive increase in shots blocked, with 38% of their shot attempts being blocked by the penalty killers, compared to only 13% before. Even at point-blank range, the struggles are obvious. Toronto’s top unit has shown it can be deadly and it has too much skill on the ice to be held off the scoresheet much longer, but they need to go back to their early season performance to get back on track. Penalty killers are making adjustments to take away set plays, forcing more shots from the outside. Now, it’s time for this unit to make adjustments of its own and get back to being one of the most dominant in the league.